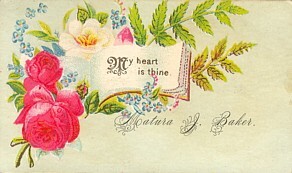 In the middle part of the 19th century hand-written cards were often made to order by experts in the art of calligraphy. These experts in penmanship might be considered the lineal descendants of the old “letter writers” of the 16th century. It was these chirographers (artists of pen decoration) who would ply their trade in the streets, parks, and fairs, quickly tossing off a dozen or so cards for a very reasonable sum. Their script had the appearance of copperplate printing with its elaborate ornamental style of lettering and flourishes of fanciful birds, ribbons, swans, quill pens, and flowers. [see card 1] For the more affluent, handpainted cards were produced by professional artists. And of course, amateurs, those scores of young ladies at home, would often strive to create their own tastefully personalized cards. 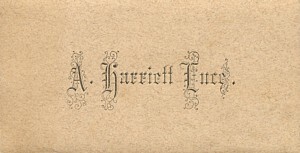 Calling cards besides always displaying the name of the donor would often times also contain an appropriate phrase or a short, often sentimental, verse. The vast majority of calling cards available were those created commercially by lithography. Up until the 1870’s, the lithography was generally monochrome - that is of a single coloured ink. [see card 2] Some cards can be obtained that were done in black ink then labouriously hand painted. 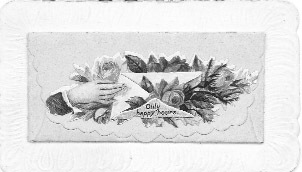 [see card 3] By the third quarter of the 19th century card manufacturers were experimenting more and more with different papers and effects - embossed cards, die cut edges, coloured cards, striped papers, linens, marbleised papers, and most importantly of all multiple colours. [see card 4] The advent of chromolithography started slowly enough through the 70’s with innovative printers attempting the combination of two or three colours at a time. [see card 5] By the 1880’s and 1890’s the art of chromolithography had reached its golden age. Magnificent combinations of fifteen to twenty colours created wondrous pictures with fabulous colour contrast and depth. One of the most intriguing developments in visiting cards in the 1880’s were the aptly named “hidden name” cards. In these creations, colourful die cut paper scraps were applied on the central portion of the card to conceal the giver’s name. These delightfully served to add a little spice of mystery for the recipient. [see card 7] The paper scraps used standardized iconography of friendship such as extended or clasped hands, birds, floral flourishes or nature scenes. As in other Victorian decorative arts the creators of calling cards made ever increasingly elaborate offerings as the century progressed. The card pictured as No. 9 exemplifies this Victorian flair for the elaborate. Not only is the calling card a “hidden name” one, but the card has die cut edges, embossed paper and best of all instead of the paper scrap simply being applied over the individual’s name, this card features it applied on a die cut envelop whose decorated flap lifts to reveal the die cut name card enclosed within! Naturally, appropriate receptacles had to be devised for the proceedings. Calling card receivers were created out of glass, wood, and, most notably, silver. Typical early card receivers were approximately six inches in diameter, and were often mounted on a pedestal. That giant of silver plate manufacturers, the Meriden Britannia Company, produced but four different designs in 1861. Twenty-five years later, in 1886, Meriden Britannia was able to offer fifty-eight card receivers and six card tables! Decorative motifs on these receivers could include butterflies, insects, owls, elephants, children, cherubs, swans, frogs, peacocks, storks, fruit, squirrels, cats, dogs, deer, flowers, fantastical foliage. 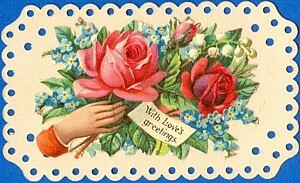 Some card trays even incorporated art glass vases in their designs. By 1890 the peak of formal elaboration had been reached. The next couple of decades saw the return to less ostentatious creations. Calling cards can afford an interesting historical perspective of the development of printing through the 19th century. Directly associated with these innovations is also the progression of Victorian decorative style. We can as well catch a glimpse of the unique social customs of that day and age with their regimented sense of decorum. As with other ephemeral items one marvels that such beautiful little momentos has managed to survive some one hundred to one hundred and fifty years and now can provide us with so much delight and joy.